HOUSTON, Texas, July 2, 2012 (ENS) – A rechargeable lithium-ion battery that can be painted onto any surface is the latest bright idea to come out of a laboratory at Houston’s Rice University. 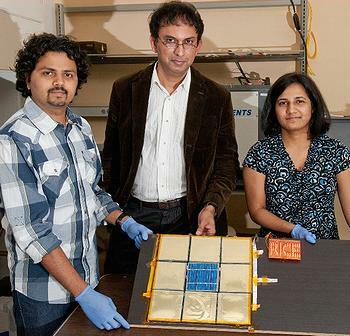 The rechargeable battery created in the lab of Rice materials scientist Pulickel Ajayan consists of spray-painted layers. Each layer functions as one of the components in a traditional battery. There are two current collectors, a cathode, an anode and a polymer separator in the middle. The technique could turn any surface into a lithium-ion battery. “We really do consider this a paradigm changer,” said lead author Neelam Singh, a Rice graduate student. Singh and her team formulated, mixed and tested paints for each of the five layered components. The materials were airbrushed onto ceramic bathroom tiles, flexible polymers, glass, stainless steel and a ceramic beer stein to see how well they would bond. In the first experiment, nine bathroom tile-based batteries were connected in parallel. One was topped with a solar cell that converted power from a white laboratory light. When fully charged by both the solar panel and house current, the batteries alone powered a set of light-emitting diodes that spelled out “RICE” for six hours. The batteries provided power at 2.4 volts. The researchers reported that the hand-painted batteries were remarkably consistent in their capacities, within plus or minus 10 percent of the target. They were also put through 60 charge-discharge cycles with only a very small drop in capacity, Singh said. The first layer, the positive current collector, is a mix of purified single-wall carbon nanotubes with carbon black particles dispersed in N-methylpyrrolidone. The second layer, the cathode, contains lithium cobalt oxide, carbon and ultrafine graphite, UFG, powder in a binder solution. The third is the polymer separator paint – Kynar Flex resin, silicon dioxide and PMMA, a transparent thermoplastic sometimes called acrylic glass – dispersed in a solvent mixture. The fourth, the anode, is a mixture of lithium titanium oxide and UFG in a binder. The final layer is the negative current collector, a commercially available conductive copper paint, diluted with ethanol. “Adding PMMA gave the right adhesion to the separator,” she explained. Once painted, the tiles and other items were infused with an electrolyte and then heat-sealed and charged with a small solar cell. The Rice researchers have filed for a patent on their technology and are seeking to improve it by finding electrolytes that would make it easier to create painted batteries in the open air. They also envision their batteries as snap-together tiles that can be configured in many ways. At MIT they are growing zinc oxide nanowires at room temperature by isolating the molecules that perform photosynthesis in plants. The nanowires provide a large surface to carry the flow of current. Co-author Andreas Mershin, said the process is easy as mixing green plants like grass clippings with custom-designed chemicals. The result is a photovoltaic material with the power of photosynthesis. Mershin wants to see this inexpensive method used in developing countries where electricity is scarce and power grids are unreliable. The only catch is that the efficiency rate is currently just one percent rather than the 20 percent of the most efficient solar cells. But both technologies are being refined quickly to meet the need for inexpensive power off the grid.